New Zealand is still coming to terms with the mass killings. 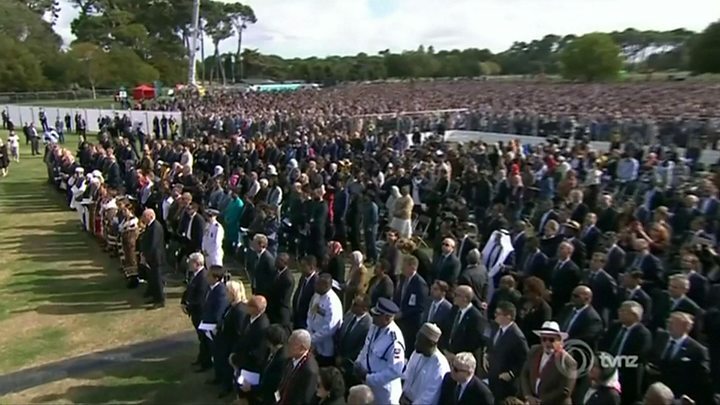 More than 20,000 people attended a memorial service addressed by Prime Minister Jacinda Ardern in Christchurch’s Hagley Park on Friday. What are the suspect’s reported complaints? According to the Department of Corrections website, “prisoners have the right to be treated with humanity, dignity and respect while in prison”. Entitlements can be withheld if prisoners are segregated “for purposes of security, good order, or safety, or for the purpose of protective custody”. The spokesperson said the suspect was being managed according to the Corrections Act and “for operational security reasons no further information will be provided”. Stuff says it is thought the prisoner has a door that leads to a concrete yard which he can use for one hour a day. He is said to be “compliant”. A court has ruled the suspect’s face should be pixellated in photographs. It is thought he will represent himself in court. Friday’s memorial service carried appeals for the rejection of extremism and embracing of humanity.